a "theme" for the intended recipient, and with or without silk flowers. Please let me know what type of design or "theme" you are looking for. I can help you choose, knowing the age, gender, business, hobbies, etc. (birthday, graduation, Easter, etc.) for which it is being given. The botanicals/toiletries may be ordered separately, without a basket. 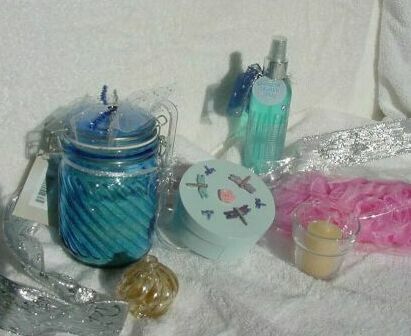 and the large variety of custom hand-made toiletry products avaiable. The final arrangement and detailing of your chosen items is at my discretion. base paper, tissue, shredded paper/excelsior, and wrapping (as needed). eucalyptus, cloth lining, or any other items I find available. however plastic is also available (for children, elderly, or any other reason). (at a higher cost), such as cobalt blue bottles, etc. All used or antique items are sanitized. I do custom painting on containers (such as wooden boxes) as well. Soap dishes, incense, music CD's, etc. availability, scheduling, final price, and other concerns. Please go to the "Ordering" page for information on ordering and shipping.